The Angraecum orchids, or Comet Orchids, are a very interesting genus of plants. Most come from Africa or Madagascar, though a few species come from other places. 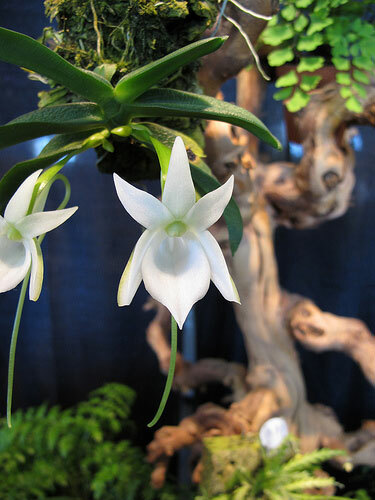 The most famous species is the Christmas Orchid, Angraecum sesquipedale. These plants are monopodial, so there's a single stem which grows upward with alternating leaves, and flower stems and roots emerge from just above the leaves. Occasionally the stem will branch. (Some species do this more than others.) They generally grow as epiphytes, but a small number of species grow lithophytically as well. Vegetatively, the plants vary widely; some are very small, others are very large; some grow upright, others hang downward. It's very hard to generalize, other than to say that they are all monopodial. They are pollinated by moths: the white color of most species makes them more visible at night (most moths are nocturnal), and the flowers are also fragrant at night. (Both of these adaptations to moth pollinators are also common in Brassavola orchids, a conspicuous example of convergent evolution that Charles Darwin didn't know about during his famous investigation of Angcm. sesquipedale.) Some species have one flower per inflorescence, while others produce several. Lighting needs vary; most like intermediate lighting, a bit greater than you'd use for Phalaenopsis, but some do well with high lighting similar to Cattleya or Vanda. The species come from enough different habitats and altitudes that there is some variation in temperature requirements, but most do best at intermediate temperatures, in the lower 70's Fahrenheit during the day (21-25C), and cooling by 10-15°F (6-8C) at night. They like good humidity of 50-70%. This is more important for plants grown mounted on slabs of bark, as their roots are more exposed than plants in pots. Water these orchids just as their potting mix dries out, or as it approaches dryness when the plant is in bloom. They like to dry out relatively quickly, so use a well-drained mix that doesn't retain too much moisture; medium or coarse fir bark works well. Some people use a more moisture-retaining medium such as sphagnum moss, but in a clay pot.